On 29 April I announced the pending arrival of a number of new additions, one of which was a 170 Ford Fordor Sedan “Highline” in pink and blue. Well, she arrived from the United States, very well packaged in its box, so I thought I would show a before and now series of pictures of her. The first picture is the image that appeared on the eBay website, and the second, taken in the hope of replicating the eBay image is how she looks now following a nice warm bath with plenty of soap, TLC and a good drying down! Unfortunately I could not quite replicate the lighting or focal length, but it is close enough! Quite a difference, and I can understand why those who were my competitors considered it was not worth very much as the final price was very, very pleasing! I replaced the white non-original tyres with original, Meccano treaded tyres following its bath, and the result is very pleasing. (Or at least it pleases its new owner!) It is not mint, or near mint, but it is near enough for my pocket money! Bruce, she looks considerably better for a wash and brush up. I'm surprised that the seller didn't do the same thing. If I were selling my car, at the very least I'd run it through the car wash. Well done for seeing through the superficial grime. You mention that it's a 'Highline'. 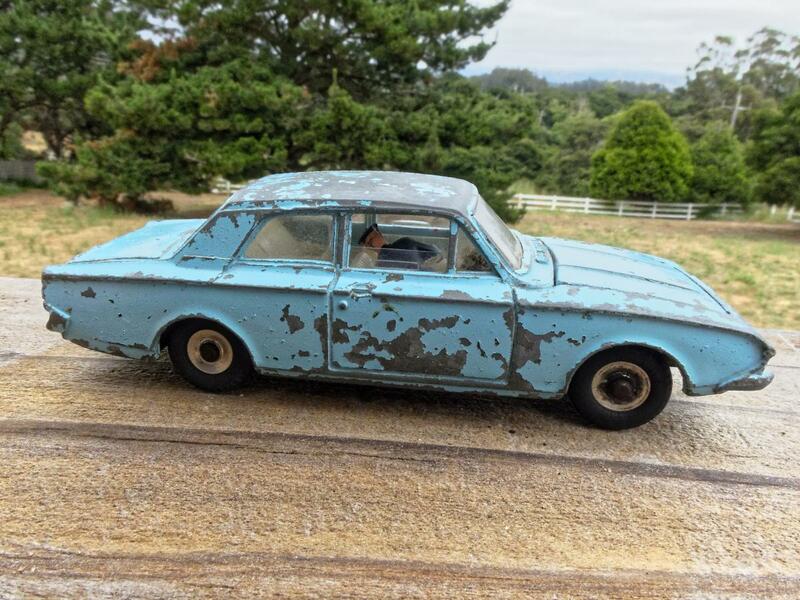 I remember that the prototype MkII Ford Consul came in Highline and Lowline versions but how do the Dinky Fords differ and is the difference obvious? Many thanks for your kind words with my latest Ford. I have found that not many sellers on eBay really bother with cleaning the models they are selling, and in many cases, this "compliments" an equally attrocious photograph! It is almost as if he/she does not really care whether the model sells or not. Those that do take the extra effort, particularly when an uncommon model is on offer usually sets a very high price! Here are the differences between "Highline" and "Lowline". This is the "Highline" version - it was issued first when the bright two-tone colours were introduced in March 1956. However, apparently the masking process created an unexpected problem on the shop floor when it came to the actual painting as there were no guidelines to be used when positioning the mask. 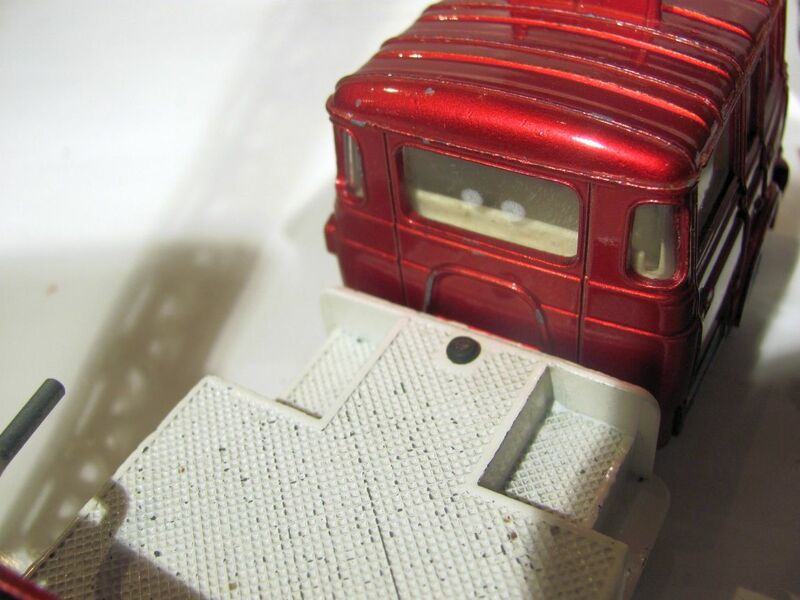 The problem was solved when it was decided to lower the mask in line with the existing cast line that represented the mould or chrome strip on the real car, and as a result, the process became known as "Lowline". As far as I am aware, it is only modern-day collectors that have given us this terminology. You will notice with the above, the line before the front wheel arch is not straight due to the lack of some form of guide on the casting. Other models were also treated similarly with "Highline" and "Lowline" painting, such as the 172 Studebaker Land Cruiser. and the 171 Hudson Commodore. Mike and Sue Richardson's tome, "The Great Book of Dinky Toys" is an excellent source of information should you wish to read more on the history and development of Dinky Toys. Unfortunately, it is long out of print although a copy may be found through www.amazon.com, or a good second-hand book store. Bruce---Very nice buy, and it sure cleaned up nice. It is amazing how well a little soap and water can restore a somewhat dingy model. I have the red and cream low-line version, and it came new with smooth tires. Did these high lines come later and always with the treaded tires? By the way, I sure never liked those heavily treaded tires, either white or black. 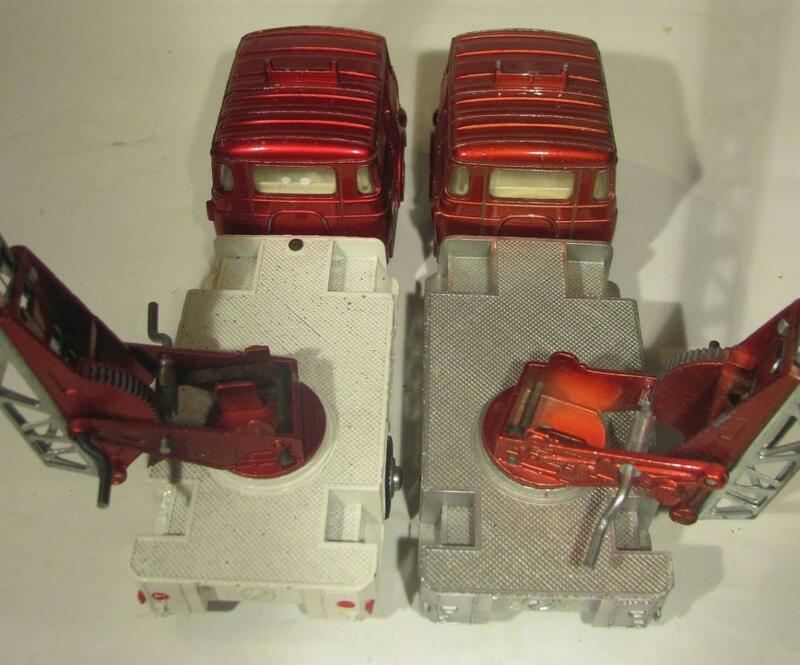 To me, they were too heavy and clunky for the automobiles they were used on; fine for a Jeep or a truck. Congrats on a nice addition! Attached here is a photo of my low-line version, purchased new from H. Hudson Dobson around 1958. Fine addition, Bruce! A seller must not manipulate a model in order to make it look better than it is, but I cannot understand why some take no trouble at all to make it look as good as it really is by a simple mild cleaning action. Well, advantage for you! Thank you Bruce for a comprehensive answer to my query. It's obvious now that you've pointed it out but I somehow had it in mind that the difference was in the casting. Doh! I have an all tan example of the Ford and an all blue Studebaker but perhaps you'd like to see my multi-coloured Studebaker? It began life as an all blue example but, from the evidence that I uncovered while stripping it, it has obviously had a chequered career. I've tried to determine which colour came before the next but it's proved tricky. Suffice to say it has been Blue, Dark Green, Orange, White, Pink, and ultimately Matt Black. Discovering all these layers was a surprise and I made the decision not to proceed any further with restoring this rather battered example and to leave it as it is. It's history is there for all to see and, to be honest, it's grown on me. John - I am with you and the layers of history your Studebaker presents! A shame to strip it all the way back to bare metal and then carry out a thorough restoration. 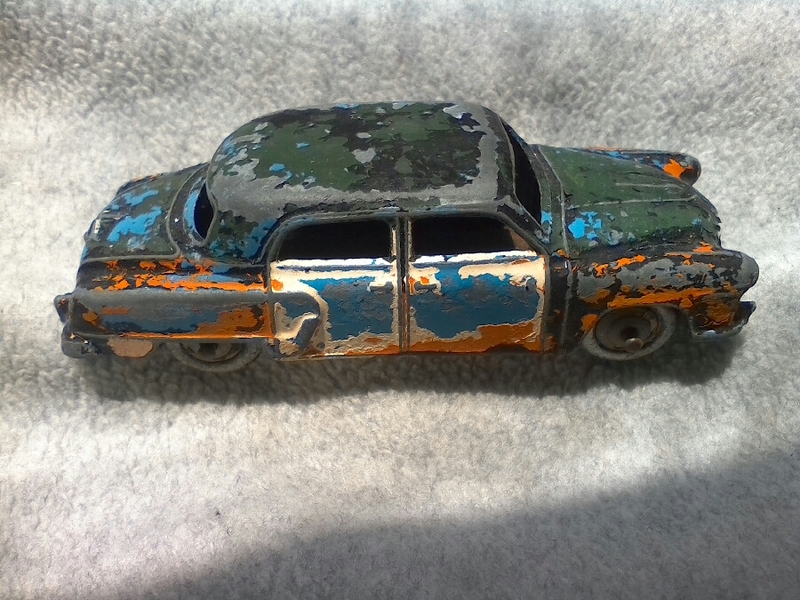 Now this is a Dinky Toy that has received countless layers of house paint! It started life if I can recall, as a deep brown or maroon. During its service, the rear axle has been replaced by Dad with a 2" nail, skillfully soldered and the excess removed. Somehow, a piece from the near-side front mudguard has become lost as too a section from the rear mudguard as well. Not to mention both headlamps are missing, and they have been MIA ever since I can remember playing with it. Of the paint, traces of yellow, red and black apart from the exterior grey can be seen. I am afraid I was responsible for the grey, as I was not fussed with the colour it covered! I vaguely recall that grey was the new colour of our guttering in the early 1950s! I think this is another job for the in-house archaeologist to handle! Afterwards we can then turn our attention to my brother's 39c Lincoln Zephyr although it is not in as bad a shape as the poor old Packard! Very interesting article about the high and low line but what about the middle line of the 139 b Hudson ? John, it seems a new branch of Dinky research has arisen: Dinky archaeology! I have lived in an older house in Amsterdam, dating from 1902. The walls were covered with a thick layer of wall-paper. Going deeper and deeper, peeling layer after layer, we discovered designs going back well into the 1920s! Jan, I propose you as Professor of Dinky Archaeology. The wheels of the Studebaker were originally the colour (Stone?) of the blue car above. I'm glad that the original colour wasn't a rare or unknown variation. Further to the comment I made on 7 May in this Topic when I collected many parcels from the post office, I am continuing with providing more work for them! The following arrived in the mail yesterday. The first is the “pick of the crop”, even though she is a little chipped, more so on one side than the other, is this very uncommon 145 Singer Vogue in lemon/primrose yellow or whatever yellow name Meccano used. It arrived together with the following three Dinky Toys from Sheffield. I was quite eager to unpack this equally uncommon 582/982 Pullmore Car Transporter in all mid-blue, as the photographs did not really match its description, but needless to say, I am delighted with its condition. Next to come hopefully, is a correct box! The next to be unwrapped was this late issue 670 Armoured Car with its plastic hubs and light yellow end-flap box, which judging on the flaps the model has hardly seen the light of day since it was made in 1969. Does anyone know of a toy shop named REDGATES? The last to be unwrapped from the first parcel was a 449 Chevrolet El Camino Pick-Up Truck whose description was very near mint with an equally excellent box. I can concur with that description. The next parcel to receive my attention was from an eBay seller in the United Kingdom, who was selling on behalf of Piers Motley the remaining models from the late John Kinchen Collection. Although I occasionally pick up a French Dinky, I mainly concentrate on the Liverpool productions, but with its heritage, I could not pass this one up having been owned by John. At first I thought the seller was playing on the name of a great collector, until I downloaded the model when it was first offered at auction by Piers Motley, and it is indeed one and the same. So here it is, warts and all! Quite a mixed bag I admit, but I am sure you all will agree with me, it contained two models which are difficult to find, especially the 145, as I have been looking for an example for about 20 years. There were two other parcels, but these contained models from the Tin Tin range from Atlas! Hello Bruce, from 'up there'. These are nice additions. I can imagine that in some instances the provenance of a model is even more fascinating than the model itself. Some models are from famous collections where they spent all, or much of their previous life, others wander all over the world before they finally land in your collection. If I can trace that track, or part of it, I am really very happy and add those data to my catalogue. I like very much you Pullmore ! it's seems as new. Here under are my "new arrivals"
As you know, I already had the Ford Vedette but this one is much better and has just some little paint chips. This Corsair arrived in the post today, and I must say it is the most chipped Dinky Toy I have ever purchased. The paint looked bad in the eBay photo, and then it was probably made even worse by the fact that the seller shipped it to me in a padded bag instead of a proper box. 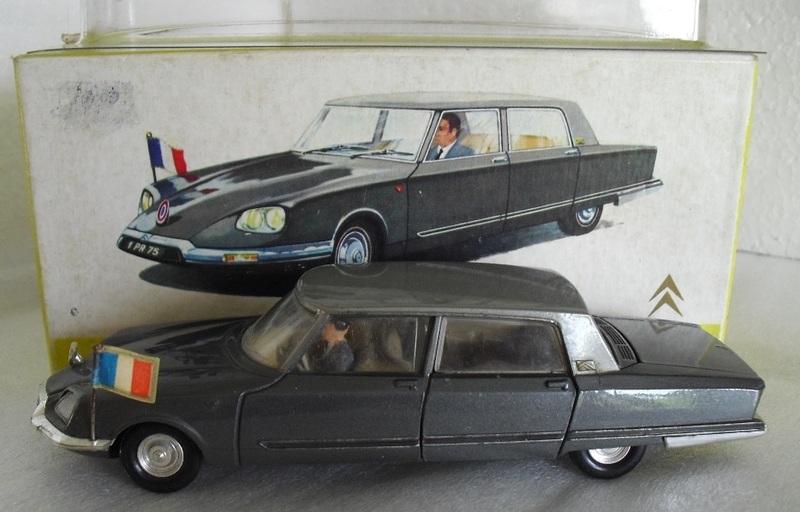 The reason why I am happy to have the model, at least as a placeholder, is not only that the light blue colour on this car is harder to find, but also that this is the version -- with the driver figure -- that came in the elusive Fun Ahoy gift set. 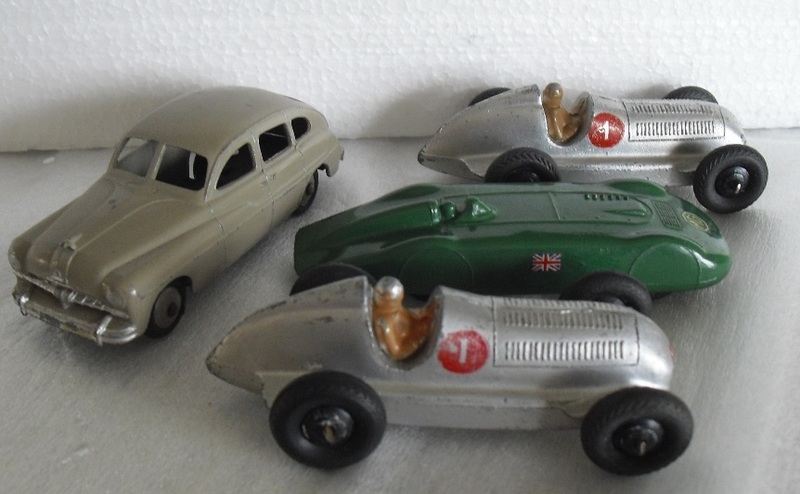 I purchased a sample of the relevant Healey Sports Boat, with its added figures, several years ago. Unfortunately whether because of the poor packing or a previous rough life, the figure is adrift inside the car. Thanks to the Corsair's opening windows, there is some hope of grabbing it and forcing it down onto the hole in the driving seat, but even if I can find the right tool, that is a test of dexterity I may never pass!! 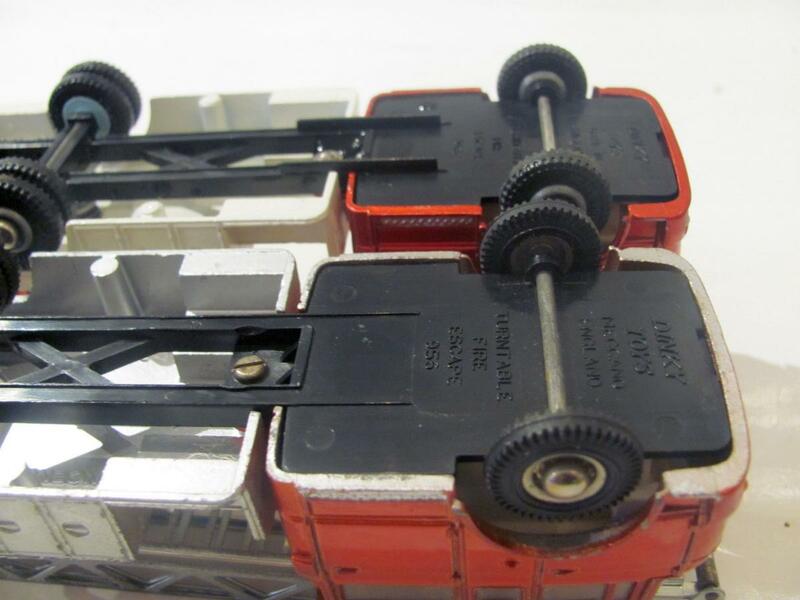 I have just reeived another version of the Dinky 956/2 (Berliet) Turn-table Fire Escape. This came about when I noticed my existing verioin had a rivet behind the cab that went right through the chassis, replacing the screw of the original. So I did an impromptu survey on eBay 956/2s and found that half had the rivet and half didn't. So I managed to secure an unriveted one for a reasonable price and postage (some postage costs are above the original cost of the item!). It has now arrived and the reason for the rivet replacing the screw is obviously because if the screw is removed (by little hands? 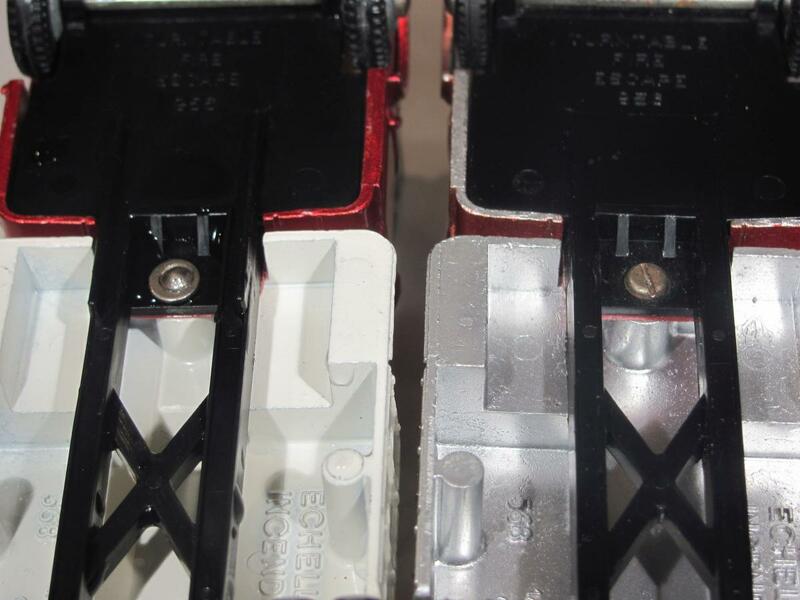 ), the thin plastic chassis is likely to break at that point. The frame has also been reinforced at that point as well. Photographed on July 16, 2008 at the Musée des Pompiers de Haute Savoie. This is the real one. The museum contains fire engines only and is situated about 20 mile from Geneva. Behind the photographer is one of the only two Delahaye (32d / 899) fire escapes of this type made. Jacques--Great photo.....thanks for sharing that with us! Arrived this morning from ....... ITALY ! at last !! now the family is complete ! Most peculiar, the flag should be on the right hand side as your other one, not the left. Any way, it looks very good. I wonder how that happened to the flag? To pick another nit regarding this sample, the roundel on the bonnet ornament is missing, as you certainly have noticed. 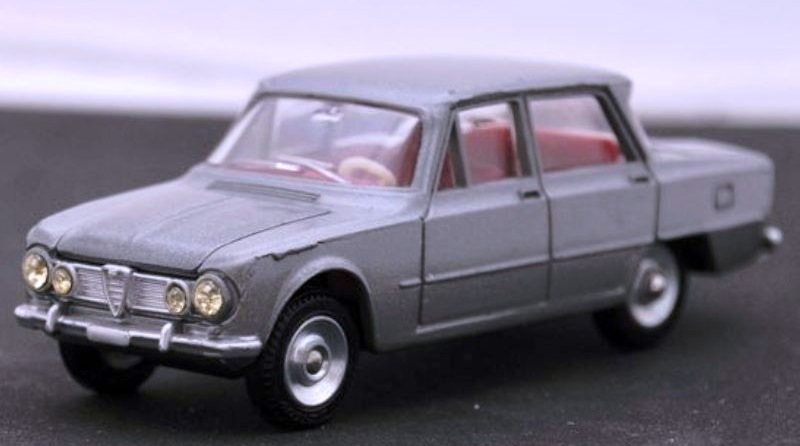 That little item is a sore point with me because when I purchased a factory-fresh sample of this model many years ago, it didn't have the roundel either. I was young with steady hands then and created my own replacement, with fairly good success. Yes, I know that the flag is on the right side but it was my way to make the difference between both models when shooting. Yes Johnny, we can find replica on the web. I was surprise to see that the french commentary on the yellow box is translated in german, dutch and italian ! but not in english ! 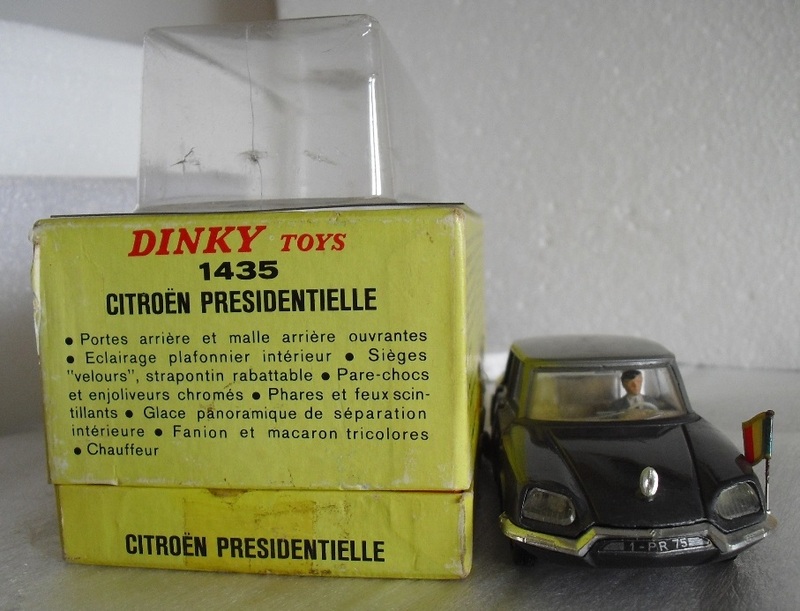 During this era French Dinky Toys were not being sold in the UK or the United States, except in the latter case through a very few specialist dealers who imported them directly. So the lack of English on the box is maybe not so surprising! Jan, congratulations with the definitiv print of the book about your collection. I have read the pre-production and had never seen such a beautiful book about a personal Dinky Toys collection before. Of course, your experience as a conservator will be useful to you in your hobby and will be seen back in the quality and content of your book. I admire people who have the quality to produce such beautiful things and spend so much time to collect details and produce articles and books about Dinky Toys. Understandably, that now you are retired, you have more time to spend for your hobby. That's a big challenge for you. I hope we can continue to enjoy your articles in the DTCA forum as before. Your books look very nice. I hope to see them in Derby next week. 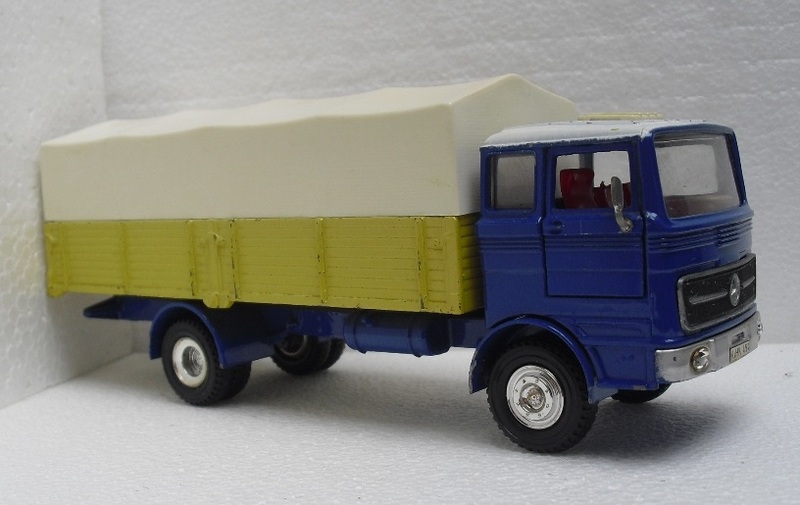 In the meantime, I got this morning the Mercedes Benz truck 917 with white cab roof. I already had the trailer since 50 years but without the truck !!! I don't know why. Jan O., your comment makes me blush, thank you. Richard, very nice to meet again next week! With all pleasure I'll show you my display copy then. A remarkable reunion after so many years, the covered Mercedes truck and its matching trailer! In my project of rather improving than expanding the collection I bought this near(er) mint (and boxed) Armoured Command Vehicle as a replacement for my previous one. Both featuring in the photo below. Kind regards, Jan W.